Fast, reliable, secure: make your localhost part of the Web. Since 2010, PageKite has led the way in making local servers public. With relays on four continents, it works with any computer, any web server and any Internet connection. Answer a few quick questions and you'll be flying in no time. Install a web server or SSH server app. What can I do with PageKite? Make any computer a server! A Raspberry Pi, a laptop, even old cell phones. Host at home: Wordpress, Nextcloud, Mailpile, Mastodon ... and all the rest. Simplify SSH access to mobile or virtual machines. Protect your privacy, take control of your data and logs. Make your sites public, but keep your home IP hidden. Name and access devices in the field, even over hostile 3rd party networks. Avoid botnets: with PageKite, the firewall stays closed and your devices are protected. Secure communications with wild-card relay certs or end-to-end TLS. Scale up: our global relay network guarantees low latency and a good user experience. Out-source ops and improve uptime with our redundant infrastructure - fully managed since 2010! Future-proof your business by building on Open Source and open standards. Skip deployment, let colleagues and clients test or remote-debug your work directly. Simplify testing on mobile devices and live networks. Interact with secure APIs and protect your work using our automatic TLS support. Run webhooks, API servers or git repos on your desktop, laptop, or in a VM. PageKite works with all HTTP and HTTPS servers, as well as SSH and few other TCP-based protocols. The pagekite.py (or libpagekite) tool automatically selects the closest working relay, minimizing latency and avoiding network outages. Nobody ever needs to know your IP address, all traffic passes through our relays. For even more privacy, we support both end-to-end and wild-card TLS encryption. See the quick-start guide, FAQ or feature list for more details. Individuals can use it for free or pay what you want: we ask for a mere $3 USD/month. Subscription, group and embedded plans for the pros from $5.99 USD/month. 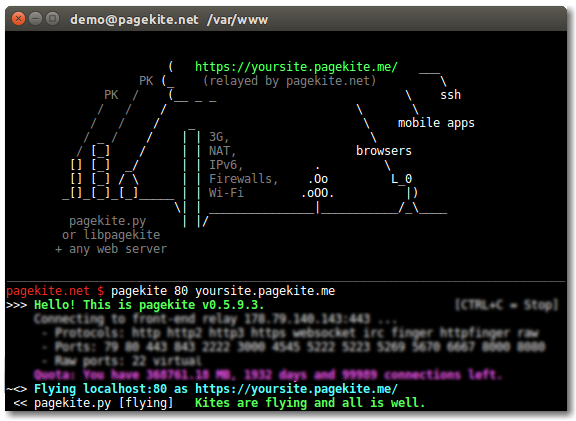 PageKite lets HTTP & SSH servers run on any device. Open Source, designed for security, privacy & digital freedom. May 25, 2018, 10:30 a.m. Happy GDPR Day!